I am replacing my clutch cable and upon trying to remove the clutch cable, the cable got stuck. I've pulled out about 2 feet from the firewall. Im guessing its hooked up on some rust or something like that, however I cannot push it nor pull it anymore (And yes I've used all my resources to pull it, except maybe using another car). Any ideas on how to free it up??? Next on the list speedo cable. I've removed the old one by cutting it in the center (under the armrest) and pulling out both ends. The cable I got from PP won't fit or I cannot see how to route it through the fire wall. Anyone replace one of these? Any ideas? All I can say is I've had the same problem. Sometimes the cables slip right out, other times they jam in there good. See if you can force the cable back in the tube some then twist it as you pull it out. Take your time, if all else fails (i.e. the cable is already jamed in there so it won't move) try taking the shifter out and see if you can reach the end of the cable and see what it's stuck on. When removing the shifter be careful to mark how the shifter slides onto the shifter rod. It must go back on exactly how it came off, or it will nick gears. Before pulling out the shifter, try a long peice of steel rod, about .125" dia. (1/8") might fit. Either buy it at a hardgoods store or a hobby shop may have one for launching model rockets. Take the rod and try to push the cable back into the car. The speedo goes through a large hole that is then covered with a grommet on the cable. The grommet is probably still over the hole because of the way you removed the cable. Only thing to watch out for when running the speedo cable is to NOT make any sharp bends. Thank you, Ill try it tomarrow. 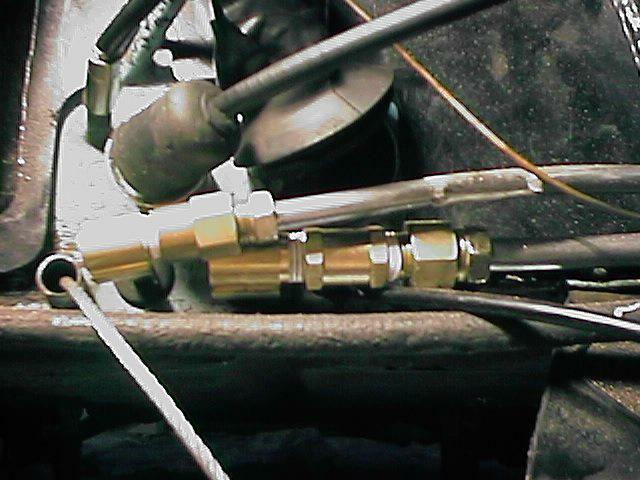 This pic shows replacement fuel lines (the two with brass colored ends) and the wire cable at the bottom (if memory serves) is the clutch cable. The speedo cable hole is the big one that is partially cut off in the picture. Thank Pelican for the pics, it's part of their fuel line replacement tech article. Usually what is happening with the clutch cable is the stud on the end is catching on the opening of the guide tube. Gently pushing back and forth with a little twisting motion usually gets it free. One hangup can also be if you haven't taken the stop nut off, it CAN'T go through. Rather than removing the shifter, you can also remove the heater lever assembly to get access to the ends of the guide tubes. Much easier than messing with your shifter. Now the problem child, the clutch cable. I removed the nuts, and everything else from the cable. I cannot move it forward or backward. I've been spraying some rust eating stuff in there and nothing. So... What would happen if I cut the tube out from the fire wall? Is it free or are there weld spots in the "tunnel of evil"? Argh! Perhaps breaking out the skil-saw and taking the top of the tunnel off is the answer. Boy I'd hate to do that. Thanks for the help guys. Bad news. There are welds (actually braze) spots further up that keep the tube suspended in the tunnel. By taking the front access plate off and using a mirror and also taking the heater lever assembly out, you should be able to see down in there to tell what is going on. Be prepared, what you see may lead to major rust repairs. If it actually is rust preventing the cable from moving, I'd bite the bullet and replace the tube. You DONT want your clutch cable binding up when you are driving along since it will probably freeze "in gear" right behind a Rolls at the stoplight. Another thought. Not absolutely sure, but if you are forced to remove the clutch tube, you might be able to reach the forward braze points through the heater and shifter assembly holes in the center tunnel. If so, you would avoid having to cut a hole in your floor pan. If you have to start cutting holes, go with the floor pan since you have the best access to the braze points from the bottom. I think it is brazed to the two heater cable tubes up front at a guide bracket hanging from the top of the tunnel. If you could cut it free without damaging the other tubes, you could slip a new one in and clamp it in place. I have a (slightly fuzzy) polaroid of the center tunnel from beneath (sans floorpan) showing all these lines. If you get into this situation, let me know and I'll scan it and email it to you. Is it just me, or did Porsche design this tunnel thing just to be a burden? why weld the tunnel in? Why not bolt it? Anyway, I looked at the cable/tube situation and see nothing wrong. You guys think cutting from the bottom is better then the top of the tunnel? I could drive my car today if the clutch worked... So lets pretend I drilled a hole in the fire wall and temp run my clutch cable in place until Friday. What kinda dmg would I do to the car? Any ideas? How about running a new tube down the tunnel, in a slightly differant location? Or maybe even just driving without cable in place (Kinda rocky starts and stops Id guess, not to mention the new trans gets destroied)? Or I coold just shoot the cable with a gun... Anyone know how to exercist a clutch cable? As you can prob tell, really don't want to cut the floor pan... Anyone, any ideas? Running a cable like that won't really hurt much, except I doubt you will be able to get enough leverage to disengage the clutch. It would be much simplar to use what you have. The only advantages to cutting from under the car are that is is easier to conceal the repair, and there is less chance of cutting into the clutch or accel tube. But, I think there is MORE chance of cutting into the plastic fuel lines from under the car. Have you tried to use a long 1/8" metal rod to pound the cable back into the car? Then try to remove it again by twisting, or just cut it, and put the new one in. Thing is, it is nice to have an extra clutch cable in the car because they break if they are out of adjustment. The tube was removed from my car several years ago( I didn't expect to keep it 28yrs)and have had nothing but clutch cable problems since. I plan on getting it replaced if I can find another one. I saw a car with the tunnel cut open from the top and a cover screwed on to cover it. Looked like a pretty good idea. If you can save the tube I would do so. If you are trying to run another tube you need to watch for alignment and putting it in the way of the shift rod. Might get a bit tricky, but I suppose it would work. The clutch tube is a straight tube, unlike the heater controls which have compound bends in them. The reason I recommended cutting up from the bottom is the way everyting is situated inside the center tunnel. You will have a devil of a time getting to the braze points from the top. In the middle of the tunnel, there is a doughnut shaped bracked hanging down from the top of the tunnel. The shift rod goes through the center of the doughnut. On the bottom of the doughnut is a notch where the clutch tube and both heater control tubes cross and are brazed in place. If I remember right the clutch tube sits in the notch and the heater tubes are brazed to the bottom of the clutch tube. From the bottom you have good access and can carefully hit this spot with a torch and "unbraze" the tubes to seperate them. I don't know how you could reach it from the top. 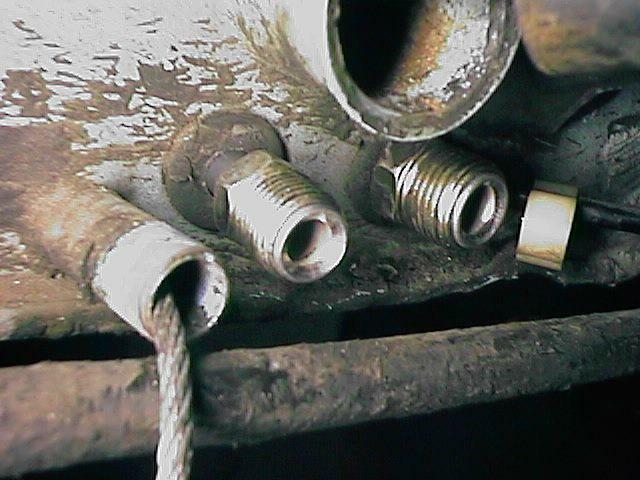 Be sure to pull your heater control cables out before you do this or you'll need a new set. If you can locate this "doughnut" and cut a 6" hole in the floorpan just below it you can probably do all the repairs from there. You may need to have your engine out also to pull the tube out the back. BTW, everything is now hooked up (I think) and ready to drive. However can't get the car started. For more info on the starting problem soo the thread "fuel pump". Thank you all so very much for your help.